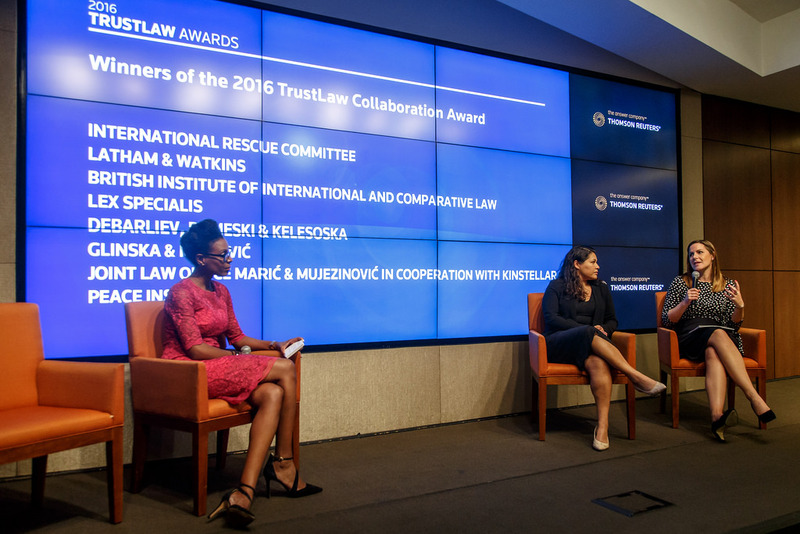 Debarliev Dameski & Kelesoska Attorneys at law – part of the legal team winning the 2016 TrustLaw Collaboration Award by Thomson Reuters Foundation for outstanding pro bono project. Deabarlev Dameski & Kelesoska (DDK) was invited by Thomson Reuters Foundation on behalf of the International Rescue Commission (IRC), to participate as a local legal adviser in a pro bono project advising on border control, asylum and refugee settlement and relocation in Europe referring to the Syrian refugee crisis. In summary, the project involved aiding the IRC with its work responding to the European refugee crisis. The IRC required legal assistance to research the international, regional and national laws relating to border control, asylum and refugee settlement and relocation in Europe. Covering 12 jurisdictions the legal team was headed by the international law firm Latham & Watkins in partnership with lawyers in Austria, Croatia, Macedonia, Serbia and Slovenia, Lex Specialis and the British Institute of International and Comparative Law, producing 42 memoranda of advice in advance of the 17 March 2016 EU Council meeting. DDK partner Dragan Dameski, along with associate Vedran Lalic, led the Macedonian team providing the urgent and high-priority local legal input. Legal team research and analysis helped the IRC as it made recommendations to the European Council about the plight of refugees in the EU and Turkey, connected to the EU-Turkey Summit and negotiations regarding the refugee crisis. DDK is honored being a part of the legal team that offered its expertise and resources to IRC, at the same time receiving the Collaboration Award at the 2016 TrustLaw Awards, in recognition of its pro bono efforts and work on behalf of the IRC, a global humanitarian organization that has provided crucial support to more than 3 million Syrian refugees and displaced persons.